Its no surprise that during this time of the season (written May 7th 2013) we should see an up-spike in the request of Pool Drain services. As pool equipment may now look complicated more so than it did a few months ago. Often people will just stop all together with their efforts and choose a more feasible route for their green swimming pool. This Dark Bottom Plaster Swimming Pool had the best results with our Pool Drain & Heavy Acid Wash Service. Or if you’re a home owner who often lets their swimming pool go to green during the winter season to save on chemicals, electricity costs, or a loss of availability of your own. A Pool Drain is a simple solution. But know that Pool Drains are not only performed for these reasons there are many more. Why spend awful amounts of money on chemicals when you can just drain it and be done with it ?” asks a customer of mine. And my answer is; “Often we don’t initially purchase hundreds of dollars on chemicals, the first time there is hope. Then after several treatments and multiples of extra pump run time than your normal usage you find no solution in sight. And since time travel currently doesn’t exist you may choose a Pool Drain service is right for you. We drain the water up to 99% of the swimming pool. Then chemically treat the remaining 1% of water. You refill your swimming pool. 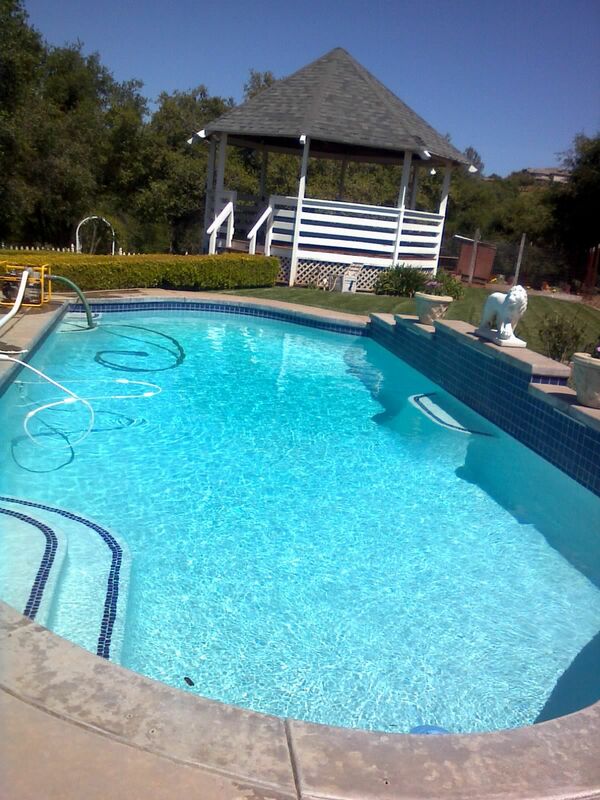 It’s a simple, fast, and low cost solution to changing your pool water. We Drain your swimming pool, rinse it out, and brush it down once full. When your pool is green and needs to be blue tomorrow, this is often the most cost effective solution for your green pool needs. When your pool has an algae infestation, its important to drain and clean with a chemical rated to kill all forms of organic life. 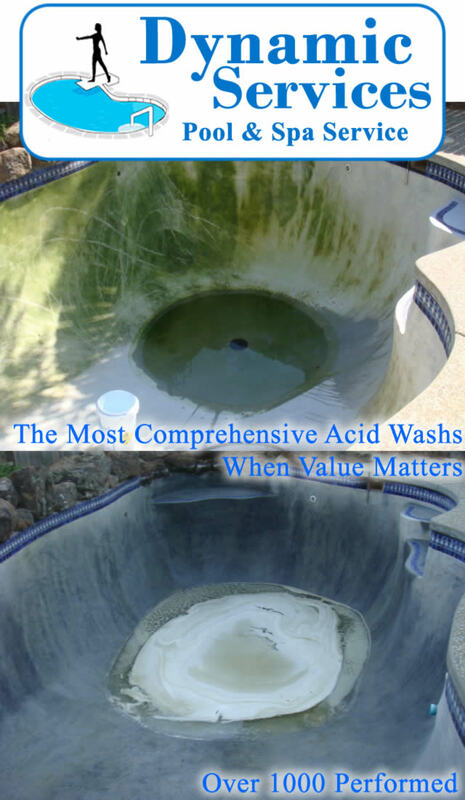 Or if you have calcium leeching through, or organic discolorations and wish to remove a fine layer of plaster to accomplish a new finish, then an Acid Wash is recommended for you. Note Acid Washes come in two forms, a light and a heavy. A light is one application while a Heavy is up to four. Its important to leave us a trash can next to the swimming pool for all drain services. But whats more important is to leave us a 2nd one. If you know you have lots of debris in the bottom of your swimming pool, leave us two, three, even five trashcans, and for one low flat rate of $50 we will remove any and all debris over 50lbs. We re-chemical your new swimming pool. Simple fast, and no nonsense. Chemicals included; Chlorine Re-balance, Ph Re-Balance, and Cyanuric Balance. When you just had your pool drained and you have a swim party this weekend, This is your service. If your stand alone spa needs to be drained, rinsed, and re-chemed then this service is for you. We drain up to 95% of the water from your spa, chemically treat the walls and remaining 5% water, and re-chem once full. The most complete clean, at one low cost.